The moment has finally arrived! The greatest live performances, a host of celebrity guests and all the biggest awards, in a magical evening at the Royal Albert Hall. Classic FM are here all day, capturing the stunning pictures. Performing 'Amazing Grace', the wonderful Andrea Bocelli opened the show with a wonderful performance, accompanied by the Crouch End Festival Chorus and the London Chamber Orchestra. Myleene Klass, looking ravishing in orange, presenting the Classic BRITs 2012. Andrea Bocelli, International Artist of the Year, is also nominated for Album of the Year, so he seems a perfect choice to kick off tonight's star-studded performances. Myleene Klass greets Gareth Malone, who is presenting the award for Female Artist this evening. Gareth Malone presenting the Female Artist award. He'll be performing later with the Military Wives Choir, who are also nominated for a Classic BRIT - a big night for Gareth Malone! Nicola Benedetti collects the award for Female Artist. She spoke out against the cuts in arts funding, and dedicated her award to music teachers. 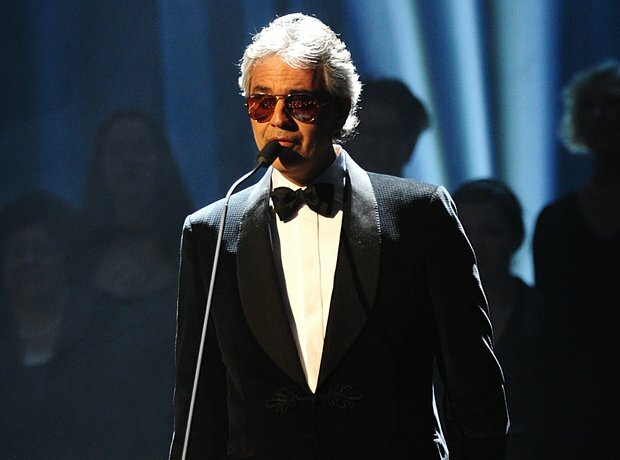 Andrea Bocelli told Lord Lloyd Webber he dreamed of one day performing a song written especially for him by the composer. An amazing musical display, from a very well-dressed orchestra of performers, headed by none other than the King of Waltz himself, André Rieu. Janet Street-Porter, presenting the Critics' Award. She said the Classic BRITs gave critics a chance to reveal their positive side and reveal what they actually like! Benjamin Grosvenor dedicated his award to his brother, who has to put up with his constant practising. He won the award for his album of Chopin, Liszt, and Ravel. Cerys Matthews presenting the Male Artist Award at the 2012 Classic BRIT Awards. Conductor Vasily Petrenko won the award, and sent his acceptance speech via video link. Miloš Karadaglić, winner of Breakthrough Artist of the Year, treated the audience to a live performance. A duo of dancers performed alongside the guitarist, showing off their sultry tango moves. Olympic gold medal-winner, cyclist Victoria Pendleton, presented the Classic BRITs Single of the Year... And the winner is...? ...The Military Wives Choir, Gareth Malone, and Paul Mealor, with 'Wherever You Are'! "You have got the whole country singing, thank you," said composer Paul Mealor to Gareth Malone. John Suchet presented the Lifetime Achievement Award to film music composer John Williams. He accepted his award via video link, and the London Chamber Orchestra performed a medley of his hits. What a treat - so many brilliant performers on stage at once, proving once and for all that everyone can sing. They performed their jubilee song, 'Sing', as streamers fell from the ceiling.